Today the fashion world is mourning the death of legendary Chanel designer and creative director Karl Lagerfeld, who passed away at the age of 85. The German-born designer was by far one of the world’s most influential fashion figures, having worked for Chanel, Fendi and his own label. According to French reports, Lagerfeld had battled pancreatic cancer and died on February 19. With his distinct dark sunglasses, white ponytail and black leather gloves, Lagerfeld was without a doubt the most successful designer of the modern age. 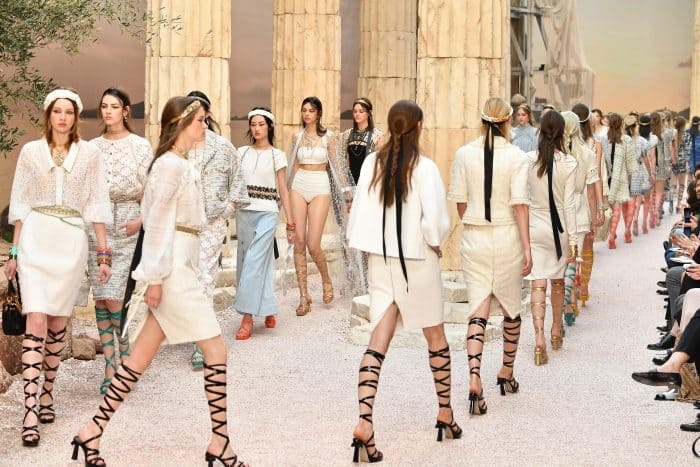 In Spring of 2017, Lagerfeld transformed Paris into Ancient Greece and took fashionistas from around the globe on a journey to Athens, which was also a nod to founder Coco Chanel, who was fascinated by Ancient Greece. A Mediterranean sunset decorated the walls of Paris’ Grand Palais, Grecian columns rose from its sandy flooring and Lagerfeld’s “La Modernité de l’Antiquité” Spring Summer collection 18 was reminiscent of Ancient Greek goddesses, with models parading in one-shouldered gowns, Grecian motifs, golden details, wreaths and gladiator-like sandals, which were the biggest hit of the evening. “I see Greece as the origin of beauty and civilization, where there was wonderful freedom that has since disappeared,” he explained, speaking of how the country inspired him. “The criteria of beauty in ancient and classical Greece remain valid. 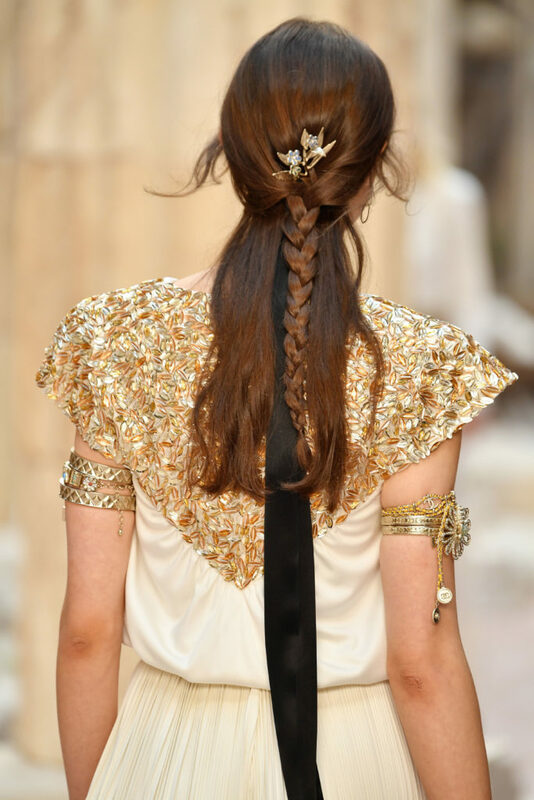 There have never been more beautiful women than the Ancient Greek goddesses,” Lagerfeld said of his collection. 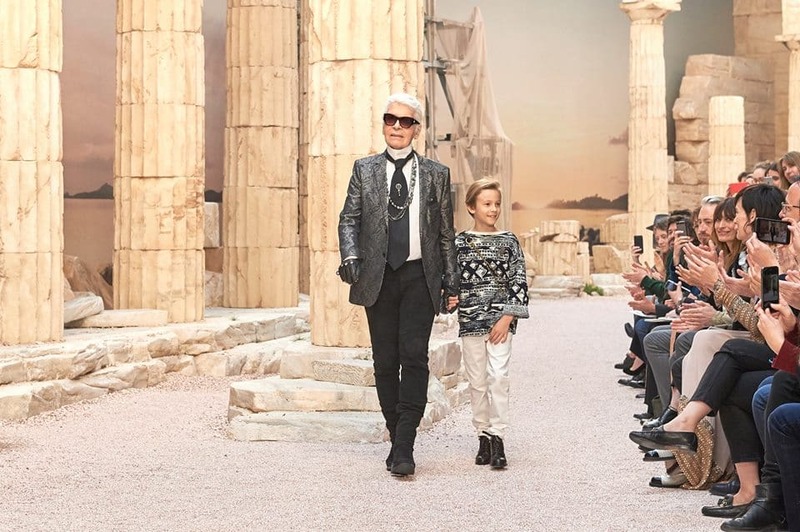 Lagerfeld also revealed that the first book he ever read was Homer’s “The Iliad” and he recalled discovering the story of the Trojan War at the age of seven.